Bhuta vidya (Ayurvedic psychiatry) is one of the eight specialties of Ayurveda. Unmada is a broad term which includes various psychiatric disorders described in modern psychiatry. The classification, etiology, pathogenesis, signs and symptoms, prognosis, and treatment of Unmada are available in all Ayurvedic classical texts. Abnormal eye movements such as “Paryakula drishti” (abnormal eye movements which denotes excitement or confusion or agitation)/“Chakshusho aakulata” (abnormal eye movements denotes confusion or perplexity)/“Chakshusho aswasthatvam” (abnormal eye movements) and “Chakshushoscha apasarpanam” (abnormal tracking) are mentioned among various signs and symptoms of Unmada. In Ayurveda, till date, no studies have been conducted, and no focus has been given on these abnormal eye movements of Unmada. The present study aims at understanding of these abnormal eye movements mentioned in Unmada with the help of modern research and literature. Abnormal smooth pursuit eye movements, decreased pursuit gain, increased saccadic frequency, increased anticipatory saccades, and anti-saccade errors are well-documented in schizophrenia patients. It seems that ancient Indian Ayurvedic sages had tremendous observational and clinical skills by which they were able to detect abnormal eye movements in the patients suffering from various psychiatric disorders thousands of years before. Various abnormal eye movements such as smooth pursuit eye movements deficits, abnormal saccadic eye movements, and other abnormal eye movements in schizophrenia resembles with “Paryakula drishti/Chakshusho aakulata/Chakshusho apasarpanam” of Unmada. Currently available research based on abnormal eye movements in schizophrenia supports the Ayurvedic view. Background: We found quantifiable effects of mobile phone-induced radio-frequency electromagnetic field (RF-EMF) on subtle energy levels of teenagers through gas discharge visualization technique in a previous randomized controlled study. The present study assesses potential protective value of simple and well-known Yoga technique of Nadishuddhi pranayama on RF-EMF-induced changes on subtle energy levels of teenagers. Materials and Methods: We enrolled thirty healthy right-handed healthy teenagers (15 males and 15 females) in the age range of 16.30 ± 2.26 years from educational institutes in Bengaluru. 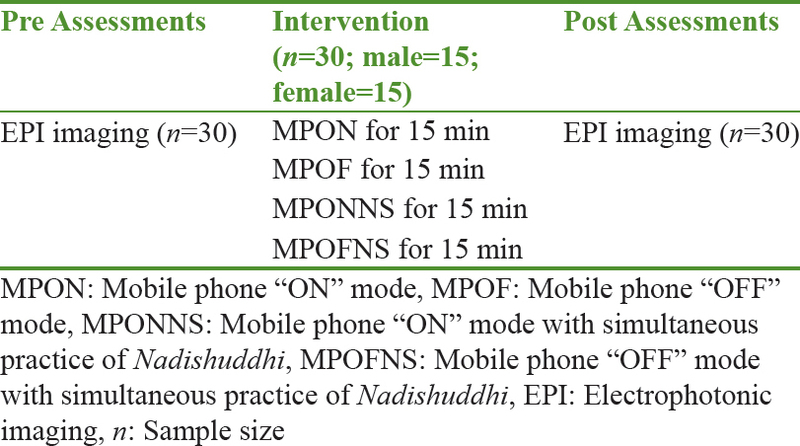 Each participant was assigned to four randomly allocated conditions on separate days: (1) (mobile phone in “ON” mode at right ear [MPON]), (2) (mobile phone in “OFF” mode [MPOF]), (3) (MPON mode with Nadishuddhi Pranayama), and (4) (MPOF mode with Nadishuddhi Pranayama). Subtle energy levels of various organs of the participants were measured using gas discharge visualization camera Pro device, in single-blind condition, at two points of time: (1) baseline and (2) after 15 min of MPON/MPOF/MPON with Nadishuddhi/MPOF with Nadishuddhi exposure, respectively. Repeated measures ANOVA with Bonferroni adjustment was applied to perform the data analysis using SPSS version 10.0. Results: After MPON condition, the following subtle energy variables showed reduction in energy levels as compared to MPOF: (1) integral area, (2) cerebral zone cortex, (3) liver, 4) spleen, (5) right kidney, (6) pancreas, (7) thyroid, and (6) jejunum. Adding simultaneous practice of Nadishuddhi to MPON condition did not enhance subtle energy in any of the organs. Conclusion: The subtle energy-reducing effects of MPON condition on various organs, as compared to sham, were consistent with our previous study. Simultaneous practice of Nadishuddhi pranayama for 15 min, during RF-EMF exposure, did not resist reduction of subtle energy levels. 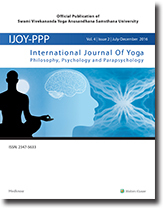 Other yoga-based techniques such as meditations may be explored in future studies. Aural keloid is a development of growth in the ear which developed after ear piercing. It can present unilaterally or bilaterally with a raised and irregular border. The present report deals with a case of “aural keloid” diagnosed as “unmantha” according to Ayurveda. Efficacy of treatment was assessed on the photography. 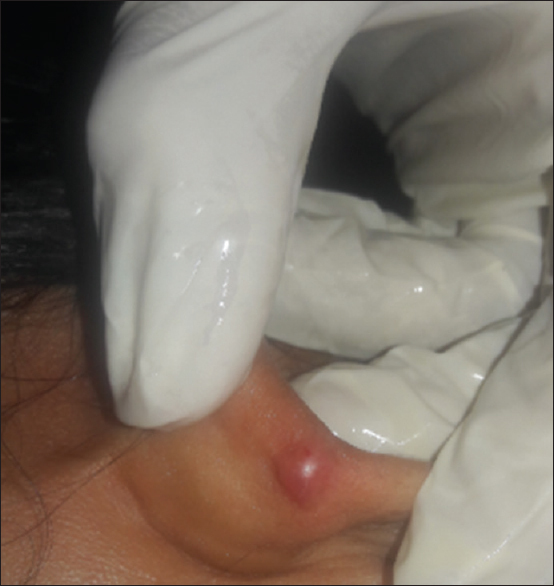 The main objectives of the treatment were to provide relief in signs and symptoms of “aural keloid” and also to prevent reoccurrences. Total four assessments were done, before treatment and after follow-up. Shastra karma is done followed by kshara karma and internal Ayurvedic medicines with dietary restrictions along with the lifestyle changes. In the present case, the patient got “clinical cure” with good improvement in itching, redness/inflammation, and also in discomfort after the procedure. With the Ayurvedic treatment procedures followed by internal medicines seem to prevent recurrence/relapse with high cure rate with no adverse effects. Emotions and behavior are interesting aspects of neurophysiology, psychological sciences, and human life. It is guided by various factors. The science of human emotions and behavior is well explained while the philosophy that is related to life is so beautifully and subtly brought about in many Indian classic writings. This goes to prove that science behind this aspect of human emotions and behavior was well-known to our ancestors. This is an attempt to bring out the interrelationship between the science and philosophy with an example from Bhagavadgita that may explain the basis of yoga.